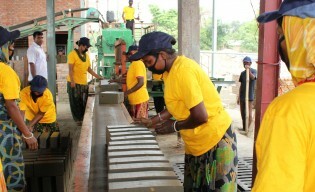 Bangladesh, a country highly vulnerable to climate change, is doing its bit to reduce greenhouse gas (GhG) emissions and glacier-melting soot by switching to ‘smokeless’ brick-making technology. Ghana has taken a major step towards reducing its under-five mortality rate by becoming the first African country to introduce two new vaccines for rotavirus and pneumococcal disease. It's called "the bearing of the body" in Burkina Faso: when a death is deemed suspicious and a group of men carry the corpse through the community, believing the deceased will guide them towards the person responsible for the death. The accused - almost always women – are then chased out of their homes. It was tough for Hassan Toure to decide to stay in his small town on the outskirts of Kidal, in northern Mali. The government troops had withdrawn on Mar. 30, and several armed groups, including militias and bandits, were operating in the region. Civil society groups are calling on the United Nations peacekeeping mission to withdraw support from a disarmament programme they say could spark further violence in South Sudan’s volatile Jonglei state. Cashew nut growers in the southern Senegalese region of Casamance are complaining bitterly that intermediaries are cutting them out of a fair share of the profits. Bangladesh continues to score good grades in achieving the Millennium Development Goal (MDG) of gender parity in education by 2015, with the trend of more girls than boys attending primary school accelerating this year. Since January, various groups of Tuareg rebels in Mali have come together in an attempt to administer a new northern state called Azawad. After almost a decade of major economic transformation, the Lao People’s Democratic Republic is on the brink of World Trade Organisation (WTO) membership. Sexual harassment of school-going girls is one factor that may prevent this Pacific island nation from achieving the Millennium Development Goal (MDG) of eliminating gender disparity in education by 2015. As thousands of people flee the conflict in South Sudan’s northern border states, increasing numbers have also been forced to leave their homes and towns in search of affordable food. Rebel leaders in Guinea-Bissau have released the country's prime minister and interim president, who were arrested in the country's Apr. 12 coup, and have flown them to Côte d'Ivoire. Saffa Momoh Lahai was just two years old when his father was killed during Sierra Leone’s civil war. Rebels attacked their family home in Kailahun District, in the eastern reaches of the country, and shot Lahai’s father when he tried to resist. When the verdict against Liberia’s former President Charles Taylor for war crimes in Sierra Leone is handed down on Thursday, it will be of no help to the many former combatants of the country’s brutal civil war who have not been reintegrated into society. Instead, they will continue to pose a threat to Sierra Leone’s future stability.